Can We Predict The Actual Date You Will Die Just By Selecting Insane Viral Videos? Would you try this stupid stunt? Would you jump if all your friends did first? Would you try this stunt? Would you like to trampoline? Would you slip and slide? Would you surf a roof? Would you dare to attempt this? Would you leap from the top of a waterfall? Would you try to out run an avalanche? RIP: Here lies [YOUR NAME] AKA Smash mouth. Never saw it coming. But it sure did! Smack! Right in the kisser. Really hurt too! RIP: Here lies [YOUR NAME] AKA Dumbass. Snow mobiles are fun! Look out for that tree! They had to surgically remove him. This is all that's left. May he rest in pieces. RIP: Here lies [YOUR NAME] AKA WatchMe. He thought he would impress his friends with his amazing athleticism. Instead he just impressed his face in cement. EMPTY GRAVE - Someday your day will come. But not for hundreds of years. Risk it all! 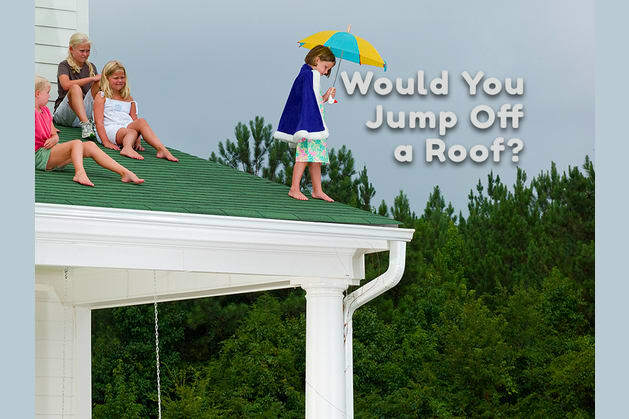 If all your friends jumped off the roof, would you do it too? Did you say yes? Then it's your own fault if you die! You never listen do you?